Research on why nature is good for us is hardly monopolized by ecopsychology; everyone from neurobiologists to social scientists have been weighing in on the subject for decades with a variety of quantitative and qualitative studies. Some of them seem to be near-repeats of each other; there are multiple studies, for example, showing that we respond better to real nature than to facsimiles like film or plasma screens with live feeds of the outdoors. Other studies go in very different directions; Korean researchers have been putting a great deal of emphasis on the overall sensory experience of nature, leading to surprising results with aromatherapy. Starting with the basics of nature’s effects on the brain, the book proceeds through how increasingly long exposure to nature has more dramatic effects. Busy people will be relieved to hear that even five minute doses of outdoor time are better than none, though periods of an hour or more have more intense and long-lasting benefits. I especially enjoyed the section dealing with multi-day excursions into wilderness, and the sense of awe that we feel once our everyday cares have been sloughed off in the face of amazing vistas. Williams acknowledges that many people are unable to indulge in backpacking trips or remote campgrounds, and brings the book back around to the need for more urban greenspace so everyone can benefit from nature wherever they may be. Along the way she meets a varied cast of characters, from fractal-obsessed nanoparticle physicist Richard Taylor, to South Korean forest healing instructor Park Hyun-Soo, who share their latest findings on nature’s restorative properties with her. She spends a week rafting down a river with a small group of female U.S. military veterans recovering from PTSD, old injuries and other combat-related ailments. And she goes hiking in a remote part of Utah with neurobiologists who alternately take in the scenery and find inspiration for their next nature-based research topics. For ecopsychologists, this is a nice overview of some of the more recent studies that have come out related to our work, along with mention of a few classics. It took me longer than anticipated to finish this book because I frequently found myself Googling names of papers and researchers to then tumble down yet another scientific rabbit hole. 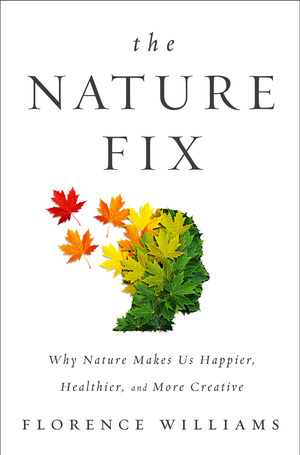 But The Nature Fix‘s target audience is the layperson, which makes it a great book to recommend to clients who are interested in finding out more about how nature may be able to help them feel better. And really, if you’re reading this review, regardless of who you are or what training you may or may not have, I think you’d enjoy this book. Really my only complaint is that I felt the various sections of the book could have been tied together a little more neatly. I particularly felt like the jump from “The Backcountry Brain”, which talked about that awe in wilderness, to the urban nature discussion in “The City in a Garden”, was a little rough. I know the journey was meant to start in the person, and then into their immediate environment, heading out into the hinterlands only to swing back home again. Still, a little clearer trail map might have helped her weave her points into a neater form. It felt a little bit like a Richard Louv work, but without quite as solid a central thesis. This is primarily a stylistic concern, though, and overall The Nature Fix has a lot of good quality information in easily digested forms without being watered down. It’s an essential addition to any eco-based bookshelf, and I really think ecopsychologists and ecotherapists in particular would find value in it. I know I’ll be referring back to it in the future.